I have been doing an exploration into Standards Based Grading. Many things I have read have shown that feedback without a grade has a bigger impact on student learning than just grades. Students typically look at the grade, and only the grade, and then put the assessment away. The goal is to get them to read the feedback, understand it and then improve their understanding. It has been an interesting transition, and the students are still trying to get their mind around the the fact that I don't assign grades explicitly as a percentage but rather I give them a proficiency level. I have been marking with the focus on feedback and growth. Students have the opportunity to fix mistakes and improve their level of proficiency along the way. This requires a little more time from me as I need to give feedback for everything assessed. It also requires students to take on more ownership for their learning, and for some of them, that is a new experience. The other piece to this, and we'll be trying this out this month, is the student conference. Grades are needed on report cards. The students need to conference with me to discuss what marks they think they should get and most importantly why. They must also come with a next step, or, how can they do better next term. It is a trial. I think it has been going well. I was using a spreadsheet that I modified from John Orr, but double entry of marks (one in the spreadsheet and one in my paper mark book) got to be overwhelming so it has fallen by the wayside for the moment. I will be continuing this through term two, but I may not give them the proficiency level as they have begun to only look for it instead of the feedback now. 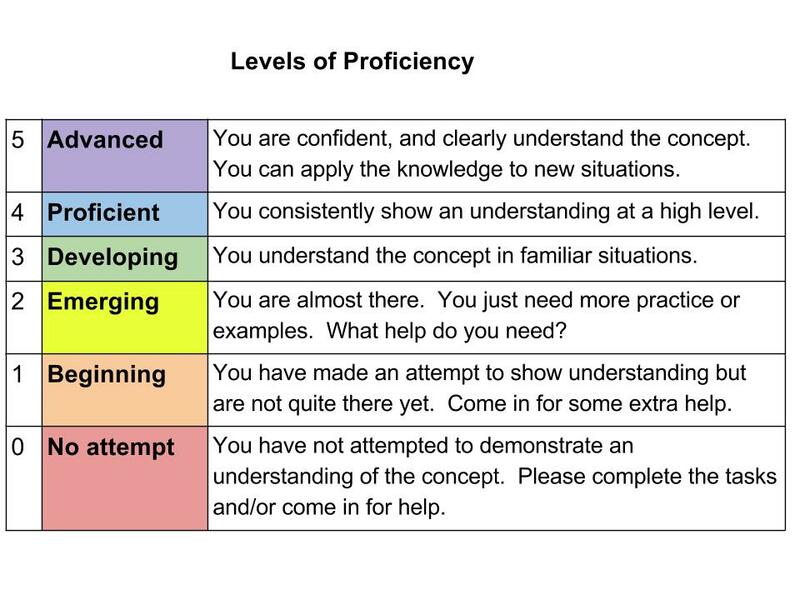 They will get the proficiency level when they ask and can explain their feedback.